Sept. 25, 2015, 9:30 a.m.
By Joseph Lichterman @ylichterman Sept. 25, 2015, 9:30 a.m.
More than 80 years later, Esquire continues to trumpet its connection to Hemingway. In the magazine’s October 2015 issue — its thousandth — columnist Stephen Marche traveled to Cuba to explore Hemingway’s legacy. 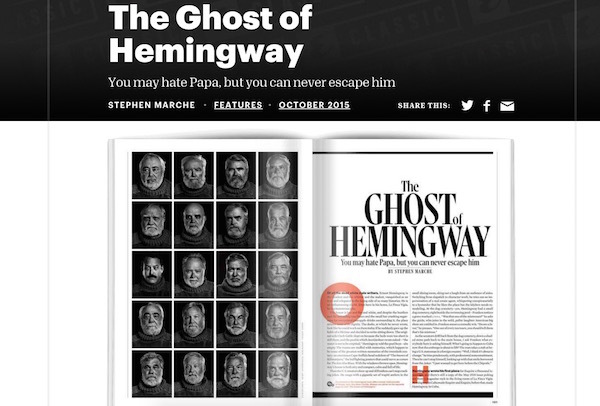 Even in 2015, Esquire wants to take advantage of content created by Hemingway and other former contributors like F. Scott Fitzgerald and Norman Mailer. 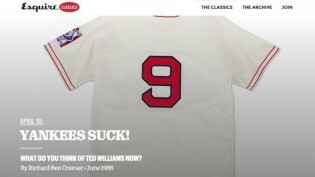 It has launched Esquire Classic, a complete digital archive dating back to the magazine’s founding. The archives include all 1,000 issues, more than 50,000 articles. Esquire spent nearly a year and a “significant” six-figure sum building Esquire Classic, said senior features editor Tyler Cabot (a former Nieman fellow) who oversaw the project. The archive is searchable and can be browed by decade. It also offers curated collections of stories around certain topics — like Yankees great Yogi Berra, who died this week — and original essays, called Editors’ Notes. The magazine is launching Esquire Classic as a standalone subscription product costing $4.99 per month, or $45 annually. Print magazine subscribers get a 50-percent discount. Earlier this year, Esquire launched one of its first experiments in repurposing old content when it partnered with Medium to republish 10 of its regular “What I’ve Learned” interviews on the platform. It also published 10 new interviews directly on Medium. The process of building Esquire Classic, however, began about a year ago. Last winter, Bondi Digital, which previously digitized the archives of Rolling Stone, The New Yorker, and Vogue, began scanning Esquire’s back issues. Esquire had physical copies of all its issues. The best way to digitize them was to remove each magazine’s binding so its individual pages could be scanned. Esquire decided that if it had at least three copies of an issue, it would sacrifice the one in the best shape to be taken apart and scanned. In instances where Esquire had less than three copies, it had the magazines scanned by hand. And when none of the issues in its collection met quality standards, Cabot’s team hunted for issues on eBay and from magazine collectors. Esquire spent “a few hundred bucks in total” buying back issues. The scanning went fairly quickly. Once it was completed, a team came in to go through page by page, story by story, adding metadata and making corrections. “That’s actually a much bigger part of the process,” said Bondi Digital co-founder David Anthony. The team tagged information like headlines, bylines, photos, captions, and advertisements. They also had to double-check the quality of the scans, making sure that each story was scanned in full, bylines were spelled correctly, and words such as “burn” didn’t look more like “bum,” for example. They are also continuing to add in the text of each story so they’re readable as plain text. Though the process was long and tedious, the detailed level of tagging was critical to building out Esquire Classic beyond just a searchable archive of old issues. Bondi first began organizing archival materials in the mid 2000’s on DVDs that accompanied histories of Rolling Stone and The New Yorker. It debuted a new embeddable format with Esquire Classic. Previously, Bondi was only able to share its scans via links that would then take users to the scans, but at Esquire’s insistence, Bondi developed an embeddable viewer that lets Esquire share interactive versions of the magazine pages. This enables the magazine to do the curation that it sees as critical to Esquire Classic’s success. So, if it wants, Esquire can highlight specific stories on each issue’s table of contents or on the Esquire Classic homepage, or post them directly to the main Esquire homepage. On the front end, Esquire partnered with the design firm Cantilever to design the main portal to Esquire Classic. To attract readers, Esquire is offering a month of access free. It’s also partnering with Shazam to make its October issue interactive: Readers can take pictures of specific features in the magazine with the Shazam app, and it will direct them to relevant stories in Classic. Cabot wouldn’t share Esquire’s subscriber goal for Classic, and it’s unclear how big the site’s audience was during the trial period. When we wrote about Esquire Classics’ launch in April, its Twitter account had 205 followers and 43 likes on Facebook. Today, those numbers are up to 1,382 Twitter followers and 3,191 Facebook likes. Cabot categorized Classic’s business model as “one big experiment.” Though the site is paywalled, Esquire purposefully made it easy to see all the different covers and stories without reading them, to highlight the breadth of the collection. Many of its greatest hits, such as Gay Talese’s “Frank Sinatra Has A Cold,” were previously published on the main Esquire site, and those will remain free and accessible. Advertisers can also want sponsor specific collections of Esquire stories. The digital archive makes it easier for the magazine’s staffers to hunt for information in old issues and continue to integrate the archival content into their current work. For years, the only way to find specific stories from the magazine’s founding through the mid-1970s was through a table of contents of sorts, put together by a graduate student who studied Esquire for his thesis. There were two little red books with the full listings in the office, and staffers had to page through them to find things. Photo of Esquire logos by FontShop used under a Creative Commons license. POSTED Sept. 25, 2015, 9:30 a.m.
Lichterman, Joseph. 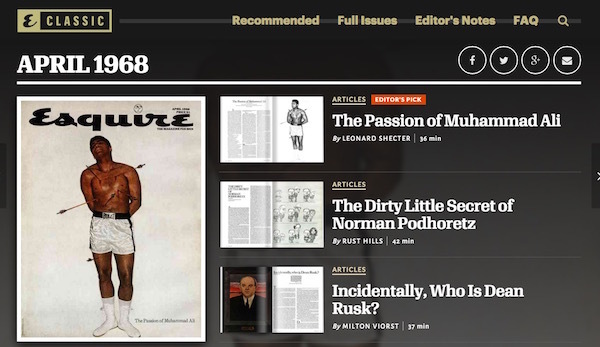 "How Esquire built Esquire Classic, a new standalone digital archive." Nieman Journalism Lab. Nieman Foundation for Journalism at Harvard, 25 Sep. 2015. Web. 24 Apr. 2019. Lichterman, Joseph. "How Esquire built Esquire Classic, a new standalone digital archive." Nieman Journalism Lab. Last modified September 25, 2015. Accessed April 24, 2019. https://www.niemanlab.org/2015/09/how-esquire-built-esquire-classic-a-new-standalone-digital-archive/.